In 1995 a major outbreak hit a major urban area for the first time. Kikwit is a large town of several hundred thousand residents in what is now central DRC, and despite two hospitals utilizing somewhat better sanitation practices than those used in 1976, the virus passed quickly from person to person, infecting 315 and killing 254. 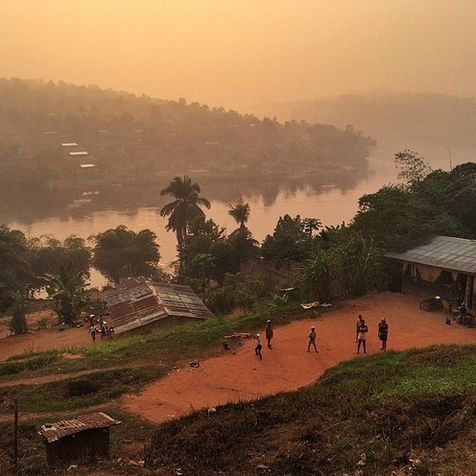 Although some recent media stories have stated that prior to 2014 Ebola occurred only in remote, rural areas of Central Africa, the Kikwit and previously mentioned Gulu (2000) cases contradict this myth and provide a precedent for how deadly—the deadliest two cases prior to 2014—the disease can become in a dense, infrastructure-poor urban setting when it is not immediately identified (as it luckily was in Johannesburg and now Lagos). Kikwit is also notable because several researchers have subsequently conducted otherwise scarce social science research into the local responses and explanations for outbreak. The origin stories recorded by de Boeck (2000), and Kibari and Lungazi (1998) describe how the people of Kikwit had a history of resisting ruthless Belgian colonial and later kleptocratic Mobutu sese seko national exploitation and told the story of how the grave of Kungu Pemba (the town’s chief who resisted the colonial state) would curse anyone who tried to sell the soil of Kikwit. Many people in Kikwit believed Ebola was a result of this curse. A competing claim linked the outbreak to an American doctor whom locals believed to have introduced the virus from labs in Europe in revenge for residents accusing him of transforming into a hippo and attacking people. By the time of the 1995 outbreak, the people of Kikwit had a long history of good reasons to distrust the national and international world and to perceive that these external forces were the cause of their suffering. Amplification of the disease in hospitals run by Western doctors did nothing to improve that trust, and, in fact, in the wake of Ebola’s toll, the town did not have a functioning hospital for two years and boycotted a polio vaccination program in large part because of continued mistrust of biomedicine. These findings from Kikwit add a layer of context to consider regarding the stories we’re currently hearing about tensions between health workers and some communities in West Africa. There may well be similar historical reasons for communities in West Africa to mistrust Westerners who claim to want to help them—after all, colonialism claimed to be “helping” Africans. Prior to Hewlett, WHO Ebola response teams did not consult social scientists with knowledge of the people they were attempting to help, but hopefully, in trying to fight the current outbreak in West Africa, WHO and other health organizations are utilizing Hewlett’s research along with liaisons who are more familiar with the local communities. Even once this current outbreak is eventually stamped out in West Africa, the state of healthcare in the aftermath of Kikwit’s outbreak demonstrates that WHO’s job won’t be finished, as there will still be work needing to be done in order to repair relations and rebuild trust with local communities. Likewise, as has been the case with past episodes of Ebola, international researchers will likely rush in once the danger has past in order to collect more information on the virology of the outbreak, potentially kindling further mistrust amongst local communities as was found to be the case by Hewlett in post-outbreak Gabon where locals complained of researchers drawing their blood and questioning them without providing explanations and then never returning with the results. A 2009 review of scientific field research on Ebola in Africa found that only 15 out the 34 teams sought individual consent from research subjects, and only three consulted any form of a research ethics committee. Instituting measures to rebuild trust with local communities—including higher ethical standards for post-outbreak researchers—will likely improve local receptions of international response to the next outbreak, hopefully lessening its severity. The next outbreaks after Kikwit were back-to-back in Gabon, followed by the major Gulu outbreak, and then, in keeping with the trend since 1994, followed every few years since by outbursts in Central Africa with the latest (prior to 2014) occurring in the DRC in 2012. During these outbreaks researchers and witnesses have documented additional noteworthy social reactions to the deadly disease such as how people in Uganda and Congo responded to government bans on traditional handshakes during the outbreaks by instead snapping fingers or bumping elbows. In Uganda business largely ceased during outbreaks because of fears that money might carry the infection, and in Sudan people resisted their loved ones being placed in WHO’s windowless pop-up isolation units because they had no way to communicate and comfort them and were not allowed to see their bodies once they had died, leading to fears that the outbreak was concocted by the international teams in order to harvest villagers’ organs. In societies where belonging to a community is everything and where pain is often treated with the constant comforting presence of a family member or friend, the concept of complete isolation from the community during a disease is utterly terrifying. This finding from Sudan may also help explain peoples’ fear of international health teams in West Africa employing isolation units. Barry S. Hewlett and Bonnie L. Hewlett, Ebola, Culture and Politics: The Anthropology of an Emerging Disease, Belmont, CA: Thomson Wadsworth, 2008. Philippe Calain, “Research Ethics and International Epidemic Response: The case of Ebola and Marburg Hemorrhagic Fevers,” Public Health Ethics, 2(2009), 7-29.